I love your lists. How about the best 48 ft -52ft aft cockpit semi production for a cruising couple with a budget up to $500,000. 2 stateroom; safe; fast; classy; easy to sail; all the bells and whistles for sailing in the Bahamas, Carribbean- AC/Genset/ electric winches, etc. vs. a refit of a Hinckley or Morris. This request peeked my interest because of its uniqueness. I receive many emails and comments but very few in regards to 50′ aft cockpit monohulls, especially classically styled models. In fact I see this market as probably the smallest around and shrinking nonetheless. For someone who grew up aboard such a design, it is disappointing to see the disappearance of this market, so with a glow of nostalgia, I present my list of 10 best 50′ aft cockpit monohullls. Beneteau 523 – One of two production yachts on this list. The Beneteau 523 is fast, strong, and beautiful but trades some build quality for a lower price point. Also a 49-foot sistership could be on this list. 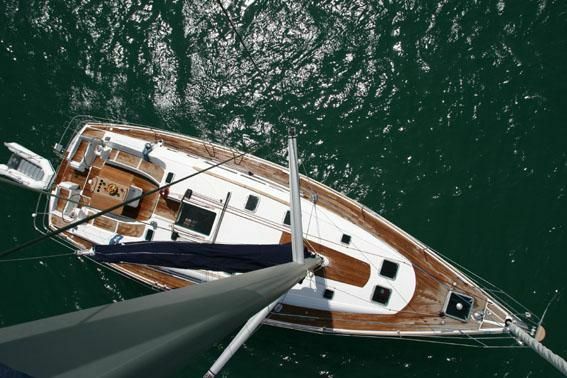 A good choice along with her Jeanneau and Wauqiuez sisters for the budget minded approach to 50+ yachting. Cabo Rico 56 – Only 2 hulls made so far of C. Paine’s flagship 56-footer that feature the incredible honey colored teak interior and traditional exterior styling of their legendary Costa Rican craftsmen. Hinckley Sou’wester 52 – If you are looking for New England lines, the 52 and her 51-foot sister should be on your shortlist. Unquestionable quality and timeless style. Almost guaranteed to be the prettiest lady in any harbour. Jeanneau SO 52.2 – The second production yacht on this list. I think they have a bit more style than the Beneteau, but I would not rate the build quality much different. Both are by CNB construction. Morris 48 – As Hinckley has lost her way with regards to sailboats, Morris has filled in. The decision may come down to your opinion of Morris’ high gloss interior finish. Nautor Swan 48 – It would not be a best of list without the Finnish heavy weight. An athletic yacht that needs at least two and maybe a third to run. At her heart, like all Swans, she is a racing yacht. Looks beautiful anchored off Fort Louis in Marigot Bay. Shannon 52 – Traditional exterior styling not unlike the Cabo Rico and maybe the purest of aft cockpits on this list. Sundeer 56 / 60 – While most the others on this list have either classic, Northeast, or French styling, Dashews boats are a breed of their own. If you are looking for a two person, offshore machine, put these and the Deerfoot models as number one. Rough, tough, and incredibly functional. Tayana 52 – Also comes in center cockpit deck molds. Beautiful, well built Perry design by Ta Yang in Taiwan. Valiant 50 – The biggest evolution of the epic Perry 40-footer. High quality, offshore ready build. The only canoe stern on this list and another outlying style choice like Dashew’s Sundeer designs. Yachts that barely missed the cut include Passports, vintage Lyman Morse, CNB customs, and Baltic yachts which are similar to Nautor designs. Most cruisers are moving to catamarans or center cockpit deck salons like a Catana or Hylas 56 at this size range. For those who still love the purity of sailing an aft cockpit and the accompanying long beautiful lines, please read through the above list and let me know any feedback. See you soon when you slip the docklines and head offshore.